This General, Organic and Biochemistry text has been written for students preparing for careers in health-related fields such as nursing, dental hygiene, nutrition, medical technology and occupational therapy. It is also suited for students majoring in other fields where it is important to have an understanding of the basics of chemistry. Students need have no previous background in chemistry, but should possess basic math skills. Raymond was crafted to take advantage of recent trends in the GOB market. 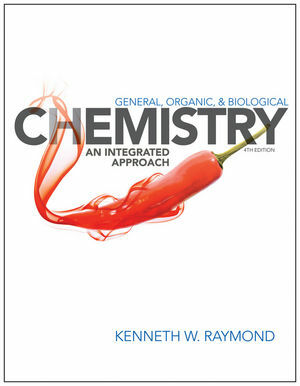 It is a shorter, lighter book with a new, integrated table of contents that develops general, organic, and biochemistry topics together, rather than in isolation. In introducing GOB material, this text uses an integrated approach in which related general chemistry, organic chemistry, and biochemistry topics are presented in adjacent chapters. This approach helps students see the strong connections that exist between these three branches of chemistry, and allows instructors to discuss these, interrelationships while the material is still fresh in students' minds. Having a shorter time interval between when a topic is first presented and when it is reintroduced can help students assimilate the material more readily.